Author’s Notes: I really like the background on this one. Klyde is the most enjoyable character ever. A bit grumpy at times; but we all hate that square Tetramino. So this is a universal sentiment. 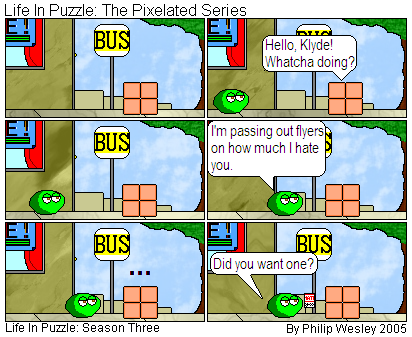 This entry was posted in Life In Puzzle and tagged awesome, comic, flyers, funny, in, klyde, life, puzzle, tetris, web, webcomic. Bookmark the permalink.